A few years ago, in the midst of an Internet scare involving a self-proclaimed psychic's warning that a shift in the magnetic field was eminent and that all life on Earth was doomed, a friend began e-mailing me the "new" compass readings showing the daily locations of the North Pole. I am not sure that it was moving as fast as he suggested . . . sometimes as much as 12 degrees in a single week . . . but I have since learned that the North Pole is, indeed, on the move. In fact, it may be quite normal for this to be happening. Searching for more information I have found articles by various writers that since assured me that there is no looming pole shift occurring and that our planet is not going to do an unexpected flip-flop. So for purposes of doom theorists, this report will serve no purpose whatsoever. Except maybe to try to explain what is going on in the core of this amazing planet and give some insight on why the North Pole is rarely at precisely North. While nobody has ever bored down deep enough to prove it, the theory is that there exists a spinning super-heated iron ball in the center of the Earth. This ball, nearly as wide as the moon, spins slightly faster than the Earth spins. Surrounding this ball is an ocean of hot, seething liquid iron that is in constant motion. Within this stuff can be found hurricanes, or whirlpools powered by the force of all of the movement of both the core and the planet. 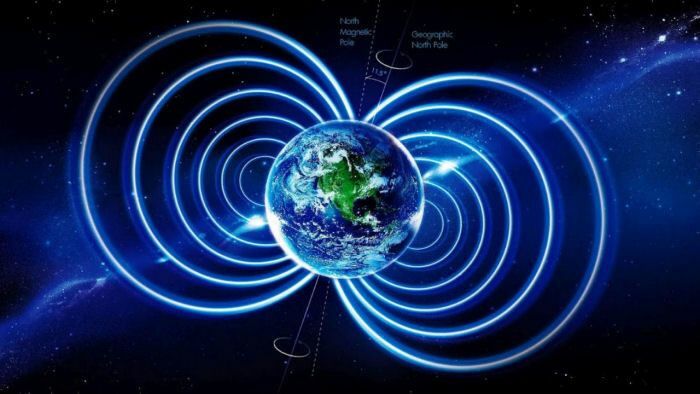 And these complex motions in an electronically conducting fluid give us the "dynamo effect," or the magnetism of energy that makes the planet a whirling, writhing, living entity. All of the movement deep in the core of the Earth is causing constant change on the surface. Small wonder, then, that the exact location of the North and South magnetic poles is always changing. Also changing is the force of the magnetic pull. Sometimes it weakens and at other times it gets stronger. We are presently in a strong period, but slowly shifting downward, scientists say. The exact location of the North Pole, if you are interested, is in Northern Canada, near a little town called Resolute Bay. But it is slowly moving northward. Larry Newitt, of the Canadian Geological Survey, says it is moving at an average speed of 10 km per year and lately has accelerated to 40 km per year. At the rate it is going, Newitt believes it will exit North America and reach Siberia within a few decades. Is there any chance that it will keep going and eventually shift completely around until it reaches Antarctica? Complete pole shifts have happened, but scientists believe they take thousands of years to occur. And they don't happen very often. The last one was about 780,000 years ago. The chance of any of us living to see another shift like that is not very probable. The point to all of this is that our planet is a living, moving, changing organism on which we happen to live. It is a part of a living moving universe that we humans take too much for granted. It does not seem to occur to most people that we are allowed to be here by the will of the energy force that runs this system. That same force, that some would call God, also possesses the ability to flip us away like the batch of annoying parasites that we have become.